These beautiful sterling silver hoop earrings are adorned with a large white LampWork glass bead with a glazed pink awareness ribbon on each side.These earrings are also available with a pink crystal bead at the top of the lampwork bead for an extra $5.00. Please choose style from dropdown menu. If no style is chosen- you will receive the earrings pictured. 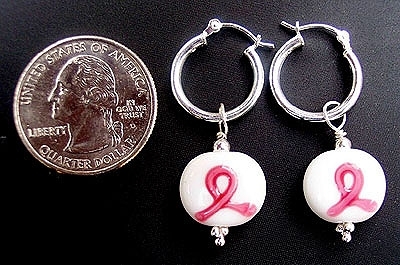 Wholesalers and Fundraisers will receive the earring that is pictured.